Indian and South African cricket teams have donated about USD 8,500 for supply of bottled water and drilling of borewells for the residents of drought-stricken Cape Town, which is facing the worst water crisis. 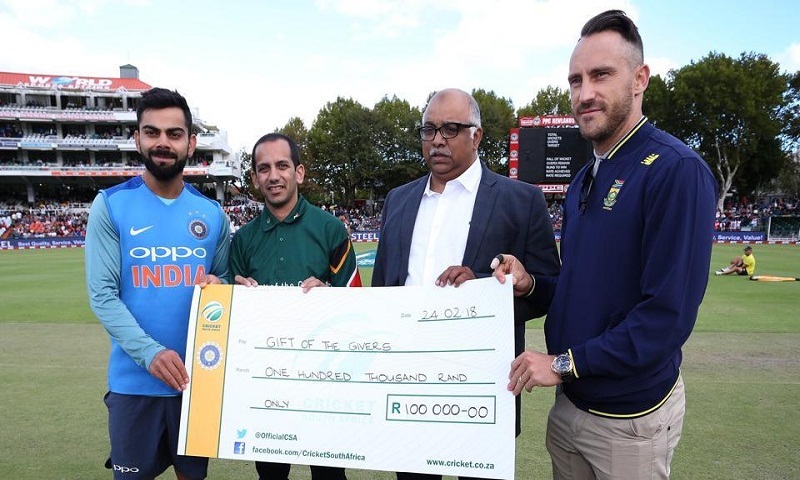 Indian skipper Virat Kohli and his South African counterpart Faf du Plessis made the donation of 100,000 Rand to the Gift of the Givers Foundation at the third T20 International cricket match at the Newlands Stadium on Sunday. The Gift of the Givers Foundation is the largest disaster relief organisation of the African continent. "Both teams had first-hand experience of the water crisis in Cape Town and, having a chat with Kohli, we decided to get the teams to sign some jerseys which we auctioned off, with the funds raised going to assist the Cape Town Water Crisis," said du Plessis.